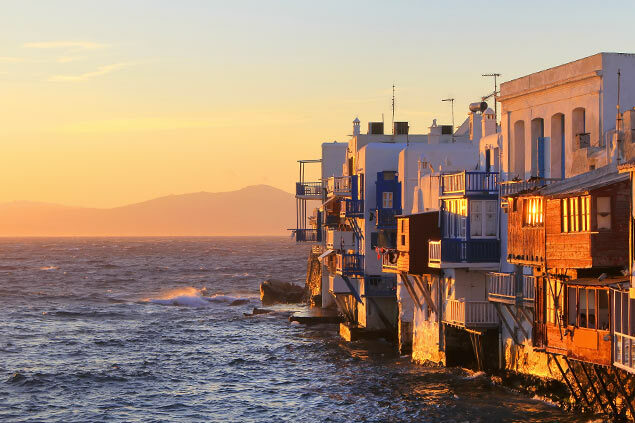 We strongly recommend the Cyclades, the Greek islands of the South Aegean sea, as a destination for your next vacation. This archipelago comprises about 250 islands arranged in a circle around the sacred island of Delos. Discover a surprising diversity of landscapes that are often dictated by the nature of the rocks of which they are composed, calcareous to the North and volcanic to the South. Nature is sumptuous, with striking contrasts between the dry and rocky land, the deep blues of the sea, and the purity of the white houses resting on the waterside or hanging on the hillside. From island to island, the architecture is of a sublime simplicity. You will enjoy having a stroll in the heart of the villages and fishing harbours, the walls casting a soft shade and bright flowers hanging from the balconies. For you, our team has unearthed rare pearls across the archipelago. 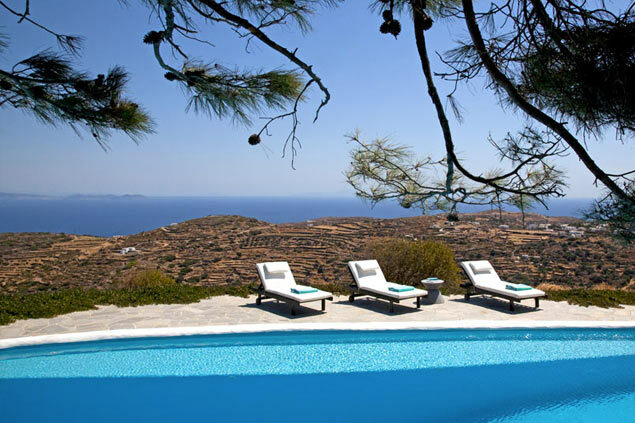 Villanovo offers luxury villas in Santorini, Mykonos, Antiparos, Kea, Koufonisia, Paros, Sifnos, Syros, Ios, Sefiros, and Tinos. All of our villa rentals in the Cyclades feature well-furnished interiors, designed for your enjoyment and wellbeing. A guaranteed change of scenery for a relaxing vacation! Villanovo takes care of everything for you. Attentive to your needs, our agents choose beautiful and charming luxury homes, with terraces that offer panoramic views over the bays of the Aegean sea, Mediterranean gardens, infinity pools, and, of course, typical Cyclades charm. 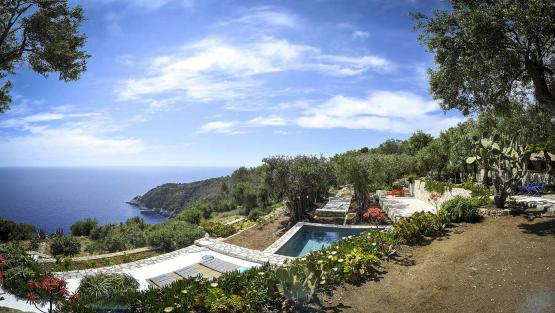 In the summer, the wind blows on the olive trees and the Mediterranean vegetation. It is unpredictable and may last a day or a week, with some islands being more exposed than others. However, it brings along a welcome coolness, the summer being hot and dry. Spring is very sunny and flowered, with the sea still cold in April but already welcoming in May. 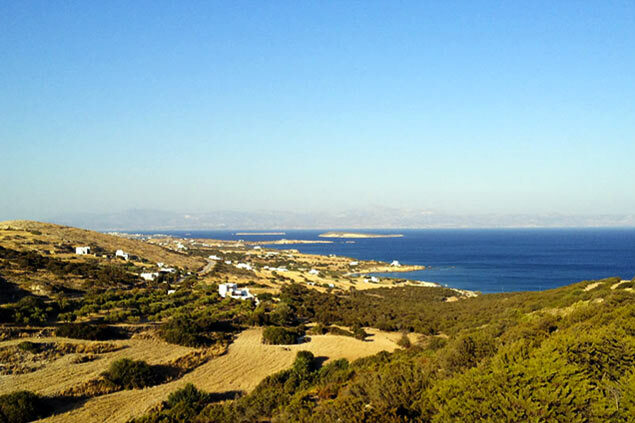 The Cyclades also offer a beautiful autumn, with a sea of an ideal softness. 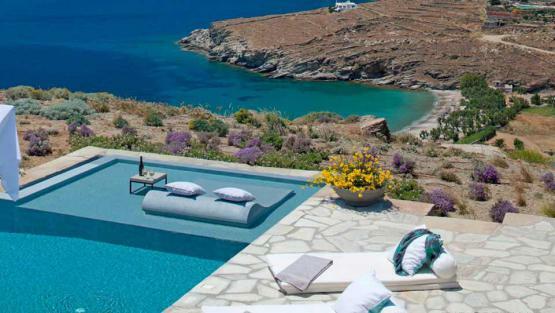 Call us to find the Cyclades luxury villa of your dreams! Each island has its own character, but all offer a wide range of activities, more family-oriented for some, more cultural or wilder for others.